Haken have released a video for their new single Puzzle Box. The song will feature on the band’s upcoming studio album Vector, which will arrive on October 26 via InsideOut Music. The video shows the band trying to solve the riddle of the Puzzle Box in a psychometric behavioural experiment… can they solve the mind-bending conundrum? Watch it below. The band say: “Puzzle Box was born from some of the jam sessions we had early on in the writing process. The music has a raw and slightly psychotic nature to it that is brilliantly complimented in Crystal Spotlight’s video. Haken fans also have the opportunity to win the puzzle box from the video, which has been signed by the band, in a new competition. Find out more. In August, the band ran another competition for one lucky fan’s artwork to be etched into side four of the vinyl version of Vector – and they’ve announced that the winner is Shakoor Bukhuth aka Shaun Beyond. 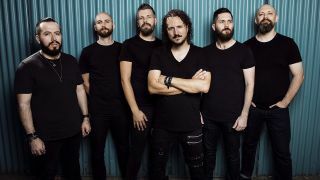 Haken will head out on the road across North America with Leprous and Bent Knee later this month. Those shows will be followed by dates in South America, Europe and the UK early next year.